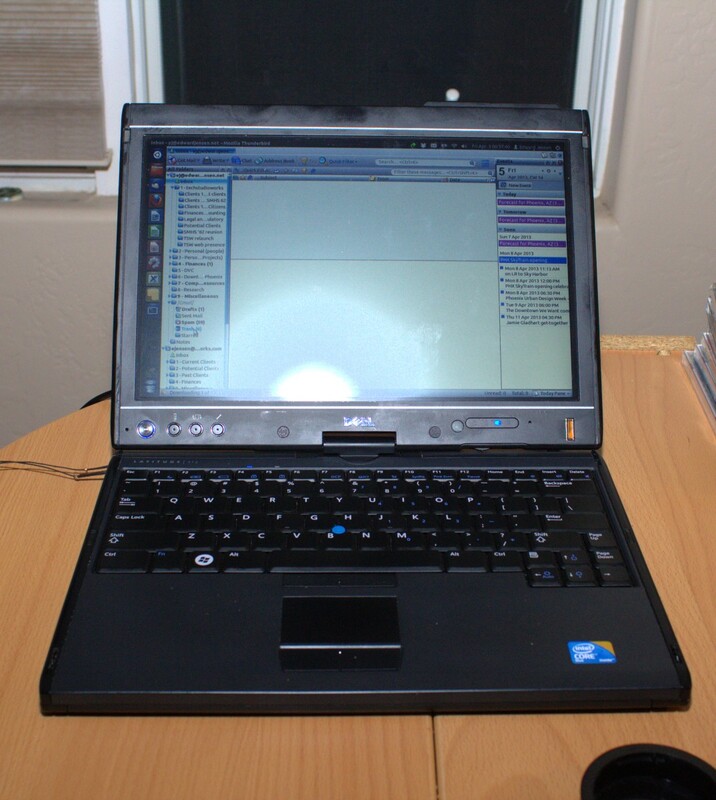 It might seem difficult getting your new Dell Latitude XT2 to work with Ubuntu; however, taken one step at a time, it’s pretty easy. I got a new computer the other day. Well, that’s a partial truth — it’s a machine that’s new to me. (The machine was shipped to its original customer in February 2010.) It’s a Dell Latitude XT2, a notebook computer that converts into a tablet PC with a resistive touchscreen. It came with a neat little stylus that works quite well for being a pressure-activated screen! I bought the machine from Dell Financial Services’ Direct Sales unit for cheap. With shipping and a one-year warranty, I only spent about $500. By comparison, when the machine was shipped new in 2010, the street retail price started just under $2,000! It was a good purchase for me because as I’m starting to run more and more errands for my consulting, sometimes schlepping around an iPad alone just doesn’t cut it. There are times when it’s important to have a full computer. As I do a lot of commuting by bicycle and public transportation, I also don’t want my MacBook Pro to suffer the wear and tear of my commute…or worse, get damaged or destroyed if I were to get in an accident. The XT2 was a small purchase that, although I’d be sad to destroy or damage this machine, I can afford to purchase a replacement should I need to. If you’re interested in my steps that I took in greater detail, I’ll go through them. Do note that most all of this is done from the terminal so your typing accuracy has to be spot on. Your results, although they should be like mine, may vary: please make a backup of your data before embarking on this journey (and don’t blame me if anything bad happens! ).